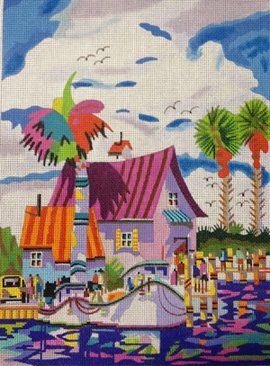 No Wake Zone is a needlepoint design by watercolor artist Ellen is bright and colorful depicting a tropical boat house and boats. It is offered by Purple Palm. The No Wake Zone needlepoint design area measures 9" x 12". Fish or Cut Bait needlepoint design can be purchased with or without fibers. If you select cotton we will send DMC cotton floss. For wool we use Bella Lusso and for silk we use Pepper pot silk fibers which are easy to stitch with. If you have lots of thread a home, No Wake Zone is perfect as a stash buster. Need more white - just contact us and we can provide some. This canvas ships free in the continental US. For further information about shipping costs see our shipping policies.